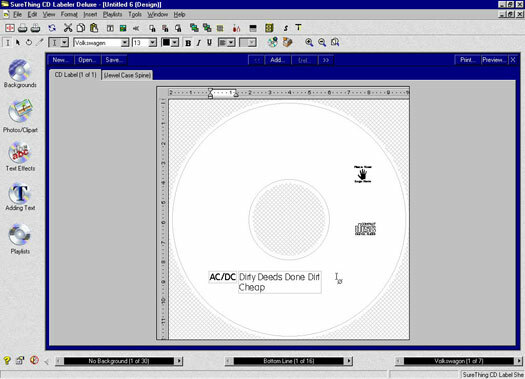 The CD Label is now displays your playlist's information. When you apply a playlist the data will populate the playlist fields on the currently displayed label, along with any unassigned playlist fields. This rule exists so that people who print out one CD and spine at a time don't have to take the extra step to apply the playlist to the spine label as well. The playlist is now saved in the current design file and becomes a local playlist. If you answer yes to this dialog, any changes you may have made at the design level will be lost. 2) Local: The second level is the local playlist(s). These are listed in the Playlists in Document section of the manager. Every playlist that has been added to a particular design will appear in this section. Editing a local playlist will change the data on any label which that playlist has been applied to. 3) Database: The third level is the playlist database which is independent of any one design file. When you apply a playlist from the database the artist, title and track information are transferred into the design file as a local playlist (Playlists in Document) and the data will populate the playlist fields on the label. Changes to the database playlist will only change the database entry, and will not effect the current local playlist or the actual design.